At this point in the saga about Europeans finding their way across the Atlantic, we need to take a detour to Italy, where a physician(1) scientist, and geographer named Paolo dal Posso Toscaneli was connecting some important dots. Like so many scientists during the Renaissance, he put together the results of contemporary research on a spherical earth within a larger solar system with information that had resurfaced from ancient times. 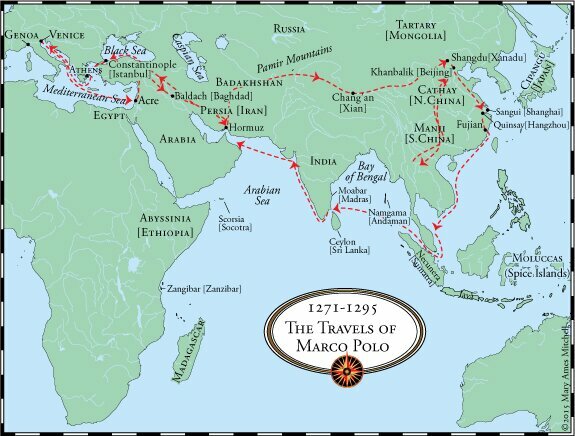 He also connected the geographic information Marco Polo included in his Travels. We have told you about Marco Polo’s visit to China, which he called Cathay(2). The manuscript about his journey, The Travels of Marco Polo, had been circulating around Europe for nearly two centuries. To this day, it is considered the best description of the Far East in the 1200s. 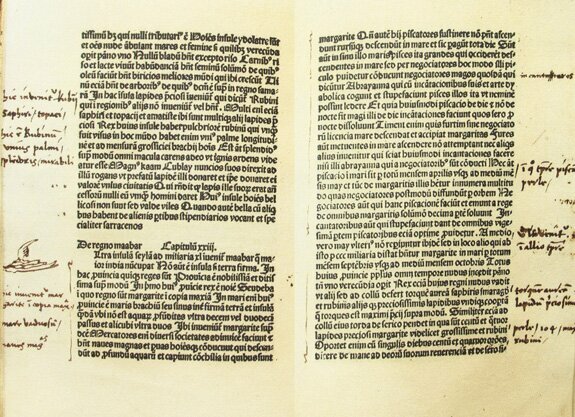 In early 1470, the year after Fernão do Po crossed the Equator, a printer in Venice began to typeset a Latin version of the manuscript that he would publish in 1477 on his new printing process. The center of printing was in the process of moving from Germany to Venice. During the same period, Paolo dal Pozzo Toscanelli in nearby Florence obtained a copy of The Travels of Marco Polo – either the pre-press draft or an older hand-written copy. Toscanelli deduced from it that a merchant ship could reach the Indies much more easily and quickly by sailing west than by sailing under the still-illusive southern tip of Africa and sailing east. First we will tell you what it was that Marco Polo described and Toscanelli found so interesting. Then we will discuss Toscanelli’s theory. Christopher Columbus in 1492, John Cabot in 1497, and Humphrey Gilbert in 1583, will rely on this information. As mentioned, Marco Polo was a son of a Venetian merchant who traveled around the Mongolian Empire as a guest and employee of the Great Kublai Khan between 1271 and 1295. He dictated his tales to a writer named Rustichello. Marco Polo described visiting areas with a variety of cultures and religions. He referred to Northern China as Cathay, Southern China as Manji, and described the headquarters of the Mongolian Empire as the Province of Tangut(3) [Northwestern China]. He referred to the Mongolians as Tartars. Soon after he returned to Venice, European cartographers began labeling Mongolia as Tartary. Polo described the Great Khan’s palace, Khanbalic(4), as being near today’s Beijing. Marco passed through countries where people adored Mahomet [Mohammad], whom he referred to as Mahametans. Marco used the term musolini for Muslims. He described Baldach [Bagdad] in the heart of Mozul [Mesopotamia] as the seat of the caliphs [Muslim rulers], from where the caliphs carried on great trade with India. Polo used the nomenclature for India as a generic country name. India referred to all the lands east of the Indus River. Africa was referred to as the farthest India. What would interest King João II of Portugal, the Order of Christ, and the Order of São Tiago two hundred years later was Marco Polo’s discovery of Christians in the East. Polo found Jacobine and Nestorian Christians in Armenia west of Mozul. He found Nestorian Christians in the province of Tangut. He found a Nestorian church in Quinsay [today’s Hangzhou]. He heard about, but did not visit, the territory of Prester John adjoining Ergivul(5), west of Tangut. He learned that the name of the current prester [elder] of the Eastern Christians was a man named Zorzi [Italian for George]. (6) This man George was said to maintain a connection to the Great Khan. 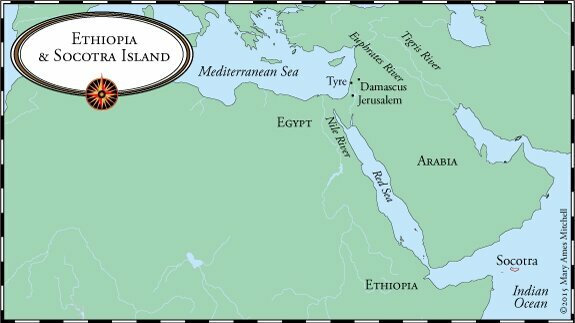 Polo learned of more Christians in Abyssinia [Ethiopia] and the nearby island of Scorsia [Socotra]. [Socotra would be Portugal’s first conquest after Vasco da Gama finally reached the Far East]. A large river called the Caramoran(7) [probably the Ganges] led from the Kingdom of Prester John to the sea [the Bay of Bengal]. From there, fifteen of the Great Khan’s magnificent vessels conducted business with the many islands in the sea [the Spice Islands]. Marco was impressed by China’s paper money and boasted of the empire’s riches. He spoke of rubies to be found in Balassia [Badakhshan in southeastern Tajikistan(9)], lapis lazuli in Tangut, turquoise and pearls in Caindu(10). He claimed that a place called Cocagio, the capital of Carian Province, abounded in gold and silver. Salt brought a yearly revenue to Quinsay [Hangzhou] of “nine thousand tons of gold.” Rhubarb was plentiful in the Tangut Province. In Ciariban [Cambodia] he found elephants, wood of aloes, and thick forests of black ebony. As Polo traveled south through Manji, and the southern province of Lochach, he learned about the islands in the Indian Ocean and Pacific where exotic spices and medicinal herbs grew. “According to the report of skillful pilots and mariners, who frequent the seas, there are seven thousand four hundred and forty-seven isles(12), of which the greater number are inhabited. And in all these islands there is no tree that is not odoriferous [with a pungent smell], does not bear fruit, or is not useful in other respects.” Referring to the monsoon winds, Polo said that it took a shipload of pepper, which was found in abundance, a year to travel to India because of two seasonal winds, one during the winter and one during the summer. North of Java Mener were Necunera [Sumatra] and Namgama [Andamam], where the anthropophagi [cannibal] people harvested red sandal wood. Polo mentioned India Major, where the people were Hindu and the women burned themselves with their dead husbands. He spoke of Moabar [Madras], which was where Saint Thomas was martyred. Christians as well as Saracens [Muslims] revered the site. Marco Polo spoke about Madagascar. He did not go there, but he reported that it was distant about a thousand miles. “The isle is four thousand miles in circumference, abundant in ivory and red sandal wood.” This was the first introduction of Madagascar Island to Europeans. As we noted, its existence would be extremely important to the Portuguese after they rounded the southern tip of Africa. Paolo Toscanelli the Physician was well educated in the knowledge of the ancients. He knew that Aristotle, during the fourth century BCE, wrote, “The regions round the Pillars of Hercules are in connection with the regions round India, and between them there is nothing but sea.” He knew that Strabo, during the first century CE wrote “a ship can sail with an easterly wind in the Western Ocean and reach the Indies.” And he knew that a Gaul [Frenchman] named Favorinus of Arelate, during Roman times [about 120 CE], wrote, “The same ocean that the Greeks know as the Atlantic Sea is known in East Asia as the Great Sea. In other words, Toscanelli had learned from ancient writings that the ocean to the west was the same ocean one would reach if they traveled to the very eastern edge of Cathay. 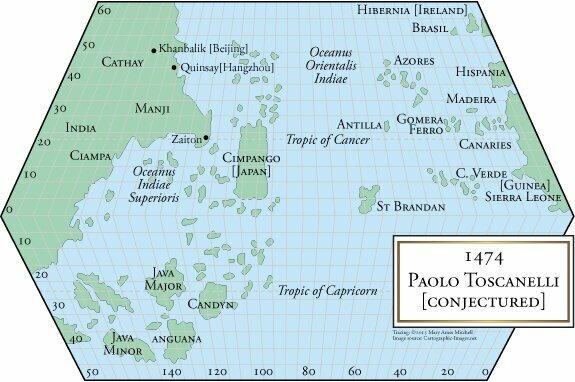 Paulo Toscanelli deduced that the islands Marco Polo spoke of in the Eastern Sea were the same islands the ancients claimed were in the Atlantic. He figured out that a ship could sail west to reach St. Brandon’s Island, Antilla, and then Cipangu. And that once a ship made it to Antilla and Cipangu, it could continue west and reach the Indies. King Afonso V connected his own dots. He realized that the information he obtained from Fernan Martinez de Roriz related to informatione he received in 1473 or 1474 from his relatives in the court of Christian I(16) of Denmark and Norway [the countries were ruled by the same monarch in those days]. Remember that all the courts of Europe were related through marriages. The Norwegians and Danes reported that two years earlier, in 1472, two Portuguese seamen [probably João Corte-Real and Alvaro Martins Homem] were hired by a Dutch [probably Flemish] company to investigate the northern Atlantic beyond Groenland [Greenland]. During that investigation, they came across an island surrounded by shallow banks hopping with fish, especially codfish [today’s Newfoundland]. The Portuguese called the land Terra do Bacalhaos [Land of the Codfish]. Apparently the explorers did not make land there, take time to look around, or stake a claim in the name of Denmark, Norway, or the Dutch. If, in fact, Diogo de Tieve had visited Terra do Bacalhaos in 1452, King Afonso V would have known about that, too. King Afonso wanted to know more. He had heard similar rumors that Lisbon mariners had sighted uncharted lands in the northern parts of the Ocean Sea. Afonso sent an ambassador to Christian I’s court to find out if the explorers who found Terra do Bacalhaos had found a northern waterway by which ships could sail westward to the Indies? At or around the same time, King Afonso sent a second ambassador to Florence with a letter from his confessor Fernan Martinez de Roriz to the renowned cosmographer Paulo Toscanelli asking for more information. Afonso wanted to know what the wise physician thought was the best sailing route to India. Should Afonso continue spending his resources toward finding a route under Africa? Or should he send his explorers west across the Ocean Sea? “Paulus the Physician sends greetings. “It pleased me to hear of your intimacy and friendship with your great and powerful King [Afonso V]. Often before have I spoken of a sea route from here to India, the land of spices; a route that is shorter than that via Guinea. You tell me that His Highness wishes me to explain this in greater detail so that it will be easier to understand and to take this route. Although I could show this on a globe representing the earth, I have decided to do it more simply and clearly by demonstrating the way on a nautical chart. I therefore send His Majesty a chart drawn by my own hand, on which I have indicated the western coastline from Ireland in the north to the end of Guinea, and the islands that lie along this path. Opposite them, directly to the west, I have indicated the beginning of India, together with the islands and places you will come to; how far you should keep from the Arctic Pole and the Equator; and how many leagues you must cover before you come to these places, which are most rich in all kinds of spices, gems, and precious stones. Do not be amazed when I say that spices grow in lands to the west, even though we usually say the east; for he who sails west will always find these lands in the west, and he who travels east by land will always find the same lands in the east. “The upright lines on this chart show the distance from east to west, whereas the cross lines show the distance from north to south. The chart also indicates various places in India that may be reached if one meets with a storm or head-wind, or any other misfortune. “That you may know as much about these places as possible, you should know that the only people living on any of these islands are merchants who trade there. “There are said to be as many ships, mariners, and goods there as in the rest of the world put together. Especially in the principal port called Zaiton [Marco Polo’s Zaitum, probably Quanzhou,] where they load and unload a hundred great ships of pepper every year, not to mention many other ships with other spices. That country has many inhabitants, provinces, kingdoms, and innumerable cities, all of which are ruled by a prince known as the Great Khan – which in our language means ‘The King of Kings’ – who mainly resides in the province of Cathay. “His forefathers greatly desired to make contact with the Christian world, and some two hundred years ago they sent ambassadors to our Pope, asking him to send them many learned men who could instruct them in our faith. But these ambassadors met with difficulties on the way and had to turn back without reaching Rome. In the days of Pope Eugenius, there came an ambassador to him, who told him of their great feelings of friendship for the Christians. I had a long conversation with the ambassador about many things: about the vast size of the royal buildings, about the amazing length and breadth of their rivers, and about the great number of cities on their banks – so great a number that along one river there were two hundred cities with very long, wide bridges of marble that were adorned with many pillars. “This country is richer than any other yet discovered, and not only could it provide great profit and many valuable things, but also possesses gold and silver and precious stones and all kinds of spices in large quantities – things that do not reach our countries at present. There are also many scholars, philosophers, astronomers, and other men skilled in the natural sciences who govern that great kingdom and conduct its wars. “From the city of Lisbon to the west, the chart shows twenty-six sections, of two hundred and fifty miles each – altogether, nearly one-third of the earth’s circumference before reaching the very large and magnificent city of Quinsay. This city is approximately one hundred miles in circumference, possesses ten marble bridges, and its name means ‘The Heavenly City’ in our language. Amazing things have been related about its vast buildings, its artistic treasures, and its revenues. It lies in the province of Manji, near the province of Cathay, where the king chiefly resides. And from the island of Antillia, which you call the Island of the Seven Cities, to the very famous island of Cipangu are ten sections, that is 2,500 miles. That island is very rich in gold, pearls, and precious stones, and its temples and palaces are covered in gold. But since the route to this place is not yet known, all these things remain hidden and secret; and yet one may go there in great safety. “I could still tell of many other things, but as I have already told you of them in person, and as you are a man of good judgment, I will write no further on the subject. I have tried to answer your questions as well as the lack of time and my work have permitted me, but I am always prepared to serve His Highness and answer his questions at greater length should he so wish. ­The map that accompanied Toscanelli’s letter was lost or has perished. However, scholars have re-constructed it based on Toscanelli’s letter, and on two maps that were influenced by Toscanelli: Martellus Germanus’ World Map drawn in 1489 or 1490, and Martin Behaim’s Globe of the World completed in 1492. We will discuss both the map and the globe in detail in a later article. You will recognize Marco Polo’s nomenclature as well as legendary places, and actual discoveries to date. It is incredible that in spite of the information King Afonso V received from his two ambassadors, he did not immediately send a ship west across the Ocean Sea. The same year Toscanelli wrote his letter, 1474, Fernão Gomez’s contract for the monopoly of trade along the Guinea coast expired. That allowed King Afonso to take back the patent, which he did, and hand it over to his son, the crown prince João, who by that time was Master of the Order of São Tiago. However, before the Portuguese could follow up on Toscanelli’s epiphany, King Afonso entangled himself in another family war of succession that would disrupt his life and exploration efforts for the next five years. The title physician had a much broader meaning in those days than it does now. Other spellings include: Cathai and Catai. The Tangut Empire lasted from 1038-1237, when Genghis Khan invaded and incorporated the lands into his Mongolian Empire. According to Wikipedia, the lands today include: northwestern Chinese provinces of Ningxia, Gansu, eastern Qinghai, northern Shaanxi, northeastern Xinjiang, southwest Inner Mongolia, and southernmost Outer Mongolia. The people were primarily Buddhist. Khanbalic is sometimes spelled Cambaluc. We are unable to find out what city or town that is today. Zorzi, also Giorgi, was a family of Venetian origin. Today the name Caramoran refers to a river in the Philippines. Badakhshan was, in Marco Polo’s time, part of Persia. It covered parts of today’s northeastern Afghanistan and parts of today’s southeastern Tajikistan. The name referred to the Badakh mountains. Even though the name is retained by Badakhshan Province in Afghanistan, the historic area where Marco Polo probably went is in Tajikistan. Cipangu was the Chinese name for Japan. I can not figure out which constellation the Maistro would have been. Any guesses? Canons were priests who worked on staff in the church cathedral. The rumors came from “Scandinavian relatives” of his cousins, the Lancasters of England. Thank you to Jim Siebols and his website Cartographic-Images.net for this translation.